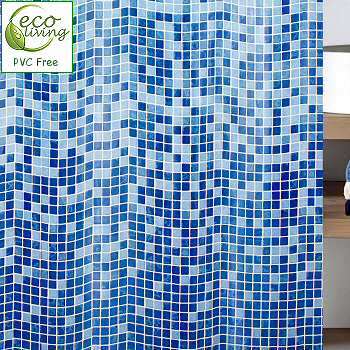 Mosaic tile design on this eco-friendly pvc free shower curtain. Blue: Colors range from medium tone blue to dark blue. Concentration of darker tiles increases towards the bottom of the shower curtain. Sun: Mosaic tiles ranging from rusty orange tones to bright orange. Concentration of darker tiles increases towards the bottom of the shower curtain.